The Birmingham and Fazeley Canal, alongside Kingsbury Road in the south-east corner of Sutton is the only canal which passes through Sutton Coldfield. This canal was opened in 1789, with a survey of the route being prepared in 1783 by the Birmingham Canal Company’s engineer, John Smeaton. Smeaton employed John Snape to make a plan of the proposed canal - John Snape, land surveyor, was a local man. John Snape was baptised at St. Chads Church, Wishaw, on October 4th 1737. His father, Solomon Snape, became master of the Wishaw free school in 1744. The school was founded by Lady Mary Hacket in 1713, and extended by Solomon to accommodate his growing family. The Hacket family had extensive estates with their main house at Moxhull Hall (this old Moxhull Hall stood on the site of the Belfry.) John Snape was employed at Moxhull Hall, where he learnt to be a surveyor, and when he began to undertake commissions for surveys he signed himself “of Moxhull”. His earliest commission, in 1761, was a survey of Sutton Rectory lands, beautifully produced, with a plan and elevation of the Rectory included. The same year he did some work for Sir Charles Adderley at Hams Hall, and two years later a much larger work, his survey of the estates of Andrew Hacket Esq. of Moxhull. 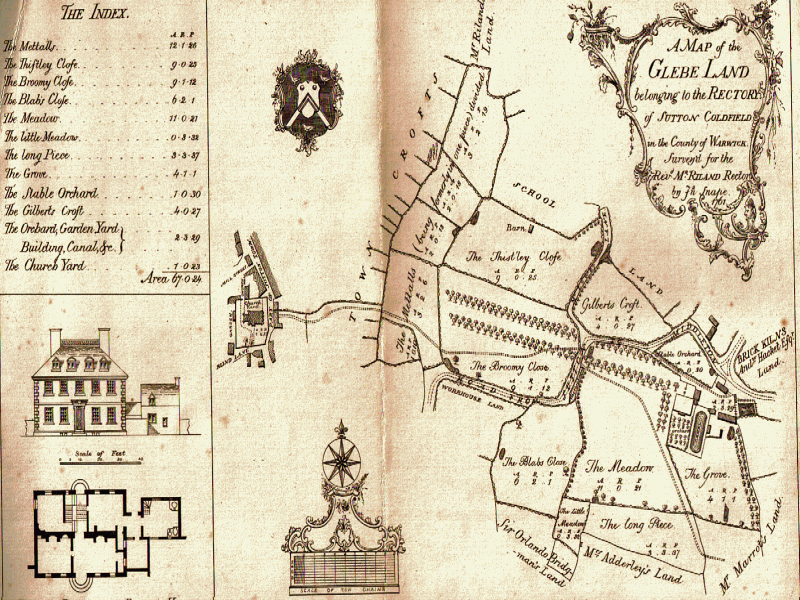 Many of the Hacket estates were in Sutton Coldfield, and the plans accompanying the survey include the earliest accurate large-scale map of Sutton. Snape continued to make estate surveys throughout his life, first for local gentry and later further afield, but in the 1780s a he worked mainly on surveys for canals. His a plan of the Birmingham to Worcester canal in 1789 includes two miles of tunnels, and he also surveyed the branch from Selly Oak to Dudley which includes the Lapal tunnel, the fourth longest canal tunnel in England, requiring accurate surveying, although he admitted at an enquiry that he had little experience of tunnels. In later life he lived in Birmingham, and when he died in 1816 he was buried in the churchyard of Aston Parish Church.